After a long winter I got up to the bee hives today and was somewhat pleased with what I saw with the exception of a single Varroa mite I saw on one of the bees, which alarmed me. I instantly rushed down to look up how to treat this. I had a preventive in my hive over the winter but to no avail, the hive appears to still have them. I looked up some treatment but then went to Long Lane's bees site and found an organic treatment for the bees. 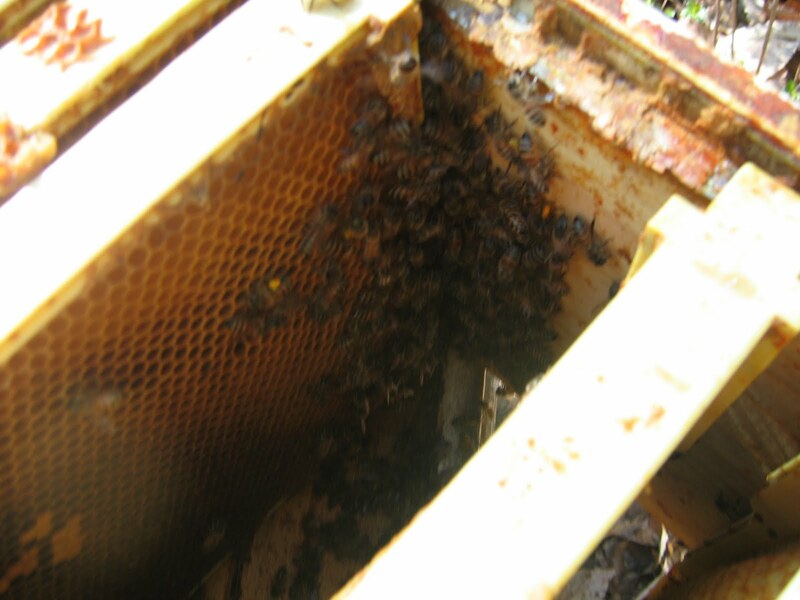 In the hive I spotted many workers, drones, baby bees as well as capped honey and capped brood. I did not find the queen but she was on the run when I smoked the hive and can very well be in this cluster of bees in this picture. She also could be out mating when I was inspecting the hive. If you look really careful at the picture you will see a dot of yellow, that is pollen one of the "girls" is carring into the hive. Overall I am happy with what I saw and am hoping for a successful year of bee keeping.